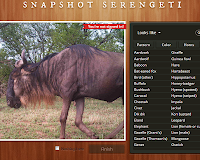 Go on virtual safari with our latest project: Snapshot Serengeti! Serengeti National Park is a UNESCO World Heritage Site in Tanzania. With an area of nearly 6,000 square miles it is teeming with some of the most recognisable animals in the world: lions, zebra, elephants, wildebeest and more live on the vast savannah and grassland plains. Researchers at the University of Minnesota have been trying to count and locate the animals of the Serengeti, and began placing automatic cameras across the park a couple of years ago. They now have more than 200 cameras around the region - all triggered by motion - capturing animals day and night. They have amassed millions of images so far, and more come in all the time. So they've team up with us here at the Zooniverse! They need the help of online volunteers to spot and classify animals in these snapshot of life in Serengeti National Park. Doing this will provide the data needed to track and study these animals, whilst giving everyone the chance to see them in the wild. Zooniverse has many other opportunities for students to participate in the research process by analyzing data. See the post from 1 year ago on this blog: Hands on Science Learning with Zooniverse for a quick overview, or visit Zooniverse directly. For ideas on how to incorporate this into your class schedule please see Mrs. Bond.